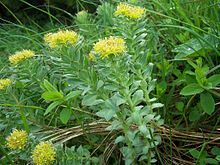 Rhodiola rosea (sea dollies, priest's pintles) is a perennial flouerin plant in the faimily Crassulaceae. ↑ "Rhodiola rosea L". Plants for a Future. 2012. Retrieved 28 February 2017. This page wis last eeditit on 5 Februar 2018, at 21:26.